Providing the Fort Worth area with professional, fast and eco-friendly junk removal services. There are a few opportunities to make money from the stuff you have tucked away in your closet or garage. The first thing to consider is if what you want to sell is actually of any value. Obviously, anything that is considered a collectible could find a decent price especially if you sell it on an auction site like eBay. As for all the other stuff that you want to get rid of, you might discover that the effort it takes to sell those things is more costly than the money you would make. That is especially true when you consider putting that stuff for sale on a yard sale. You’re setting yourself up for a lot of work when it would be much easier to just call Junk King Fort Worth to get rid of your rubbish. 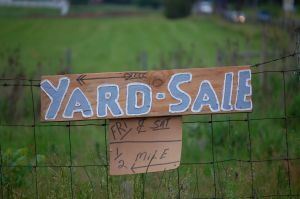 Despite what you might think, running a yard sale is not free. You would have to invest in some poster material so that you can make signs put around the neighborhood. If you don’t advertise your yard sale, then you run the risk of having nobody show up. There is also the time factor consider. You could easily give up an entire Saturday or Sunday for your yard sale and only make a couple of dollars. Is your time worth that amount? There is also no guarantee that at the end of the day you will be able to be rid of all the stuff you want to let go. That means dragging it all back into the house which kind of defeats the purpose. All of this can be fixed with one call to Junk King Fort Worth. Junk King Fort Worth is going to send over a two-man moving crew and a big truck to facilitate your rubbish hauling. You don’t have to move anything outside for the Junk King team. All you’re going to be doing is showing them exactly what you want taken away and they’ll handle the rest. Junk King Fort Worth also is dedicated to an eco-friendly disposal policy. That should make you feel good about turning over all your stuff to them. If you want to get rid of your rubbish the fast and efficient way, then Junk King Fort Worth is the call to make. This entry was posted in junk removal and tagged Junk King, junk removal, rubbish, yard sale on September 25, 2016 by Cody Rodgers. Last updated August 8, 2017 .